Product prices and availability are accurate as of 2019-04-21 20:44:18 UTC and are subject to change. Any price and availability information displayed on http://www.amazon.com/ at the time of purchase will apply to the purchase of this product. 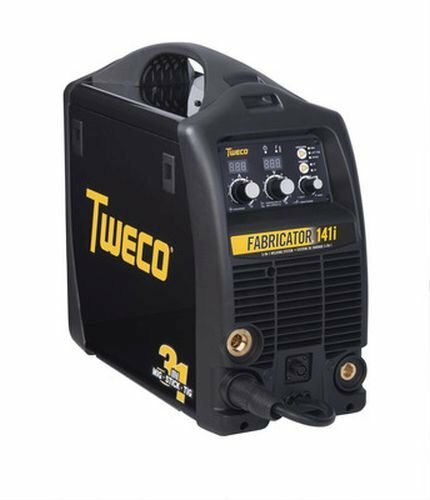 The Tweco W1003141 Producer 141i 3-in-1 MIG/Stick/TIG Welding System is the only item of its kind. It includes MIG, Stick as well as TIG procedures-- complete in one system. It's the lightweight system that has altered the game. This mobile powerhouse is designed to tackle any kind of MIG, Stick or TIG job it satisfies. It supplies up to 140 Amps of welding power as well as weighs less than 33 pounds. The portable 141i supplies the flexibility you need in the area, including applications like vehicle fixing & personalization, ranch as well as cattle ranch, training establishments, upkeep & fixing, sheet steel & light construction, on-site & mobile welding applications as well as home hobbyist DIY tasks. 3 procedures, one equipment. There's never been a mobile power system like this before. Device Specifications: Maximum result: 140 Amps MIG (GMAW/FCAW) Welding Outcome at104 degrees F (40 degrees C): 140A/19V at 15% Task Cycle; 90A/18.5 V at 20% Task Cycle STICK (SMAW) Welding Outcome at104 degrees F (40 degrees C): 90A/23V at 15% Task Cycle; 80A/23.2 V at 35% Task Cycle TIG (GMAW) Welding Outcome at104 degrees F (40 degrees C): 140A/15.6 V at 15% Task Cycle; 100A/14V at 20% Task Cycle Current range: 10A - 140 Amp MIG Welding Voltage Array: 14.5 V - 19V Cable Size Array - Strong: 0.023" - 0.030" (0.6 - 0.8 mm); Stainless-steel: 0.023" - 0.030" (0.6 - 0.8 mm); Flux-Cored: 0.030" - 0.035" (0.8 - 0.9 mm) Cable feed Speed Array: 100 - 600 IPM (2.5 - 15.2 m/min) Measurements (H x W x D): 16.14" x 8.27" x 17.72" (410 x 210 x 450mm) Weight: 32.2 pounds. (14.6 kg).